John Paulson made his fortune by taking a massive short position against the US housing bubble. Today the hedge fund billionaire is betting that the US political system will fail. This time he has company. Other billionaires have launched a lawsuit to force the US Treasury to pay shareholders vast sums from the government-sponsored housing enterprises that it bailed out in 2008. Betting on Washington’s largesse has become a routine investment strategy. Whether this one works, aspiring billionaires should take note: if you want to strike it lucky, try shorting American democracy. The risk is small and the rewards are spectacular. In 2008, the US government did “whatever it takes” to save the world economy from a rerun of the 1930s. Bailing out the people who had caused the crisis was an ugly spectacle that helped embitter politics in the US and elsewhere. But it was a necessary evil. The alternative was too dire to contemplate. As it usually does, the US system got its act together in an emergency. The real problem is how it functions in normal times. Two of the largest beneficiaries of Washington’s firefighting were Fannie Mae and Freddie Mac, the mortgage underwriters, which took $187.5bn in taxpayers’ money to keep them alive. Without that infusion, the entire US housing finance system would have seized up – and with it the global economy. And Fannie and Freddie would have ceased to exist. Six years later, some of the richest people on the planet are petitioning the courts to reward Fannie and Freddie’s shareholders for having been rescued by the US taxpayer. Last week, the two enterprises, which are in government “conservatorship” – a step short of nationalisation – said they would bring their total dividend payments to the US Treasury to $213bn since 2009, which is above the original bailout. Although both enterprises were delisted, investors bought their common and preferred shares on the grey market and now want their speculation redeemed. The US Treasury rightly argues that the dividends do not qualify as a repayment of the bailout. Moreover, it is the government that will pick up the bill if the housing market goes into reverse. The losses will continue to be socialised even if the gains are temporarily flowing to the taxpayer. Bill Ackman, the activist investor, last week predicted that the case would go all the way to the US Supreme Court. Given its recent record, that should be little comfort to American taxpayers. But the hedge funds’ real game is to stop Congress from passing legislation that would wind down the two behemoths and share part of their vast mortgage risk with the private market. As long as Fannie and Freddie stay alive, there is hope for the speculators. Last week the hedge funds notched up a big success: the Fannie/Freddie reform bill ground to halt in the US Senate and is now highly unlikely to pass in 2014. The fact that they lobbied Congress heavily is one reason why the bill is stalling. There is nothing to stop them spending more. The return on lobbying in Washington is astronomic. If they win, the speculators will get $33bn in taxpayers’ money. If they lose, their outlay was a drop in the bucket. Last year, overall lobbyist spending in Washington was just $3.2bn – a minute sum given the returns available. The stakes for the future of the US housing market are high enough. During their golden years before the meltdown, Fannie and Freddie profited hugely from being considered by investors as too big to fail. That enabled them to borrow cheaply at near sovereign rates, and produce monopolistic profits for their shareholders. Fannie and Freddie did as much as any Wall Street firm to underwrite the US subprime mortgage bubble, even if they did not invent it. Winding them down is arguably the largest piece of unfinished business from 2008. But the quality of US democracy is also at stake. If the hedge fund titans can bend two out of three branches of the US government to their will, it will set a toxic precedent. With enough money, you can pull off anything. Public policy can be auctioned off to the highest bidder. Paying off vulture funds will get seniority to the taxpayer. Some argue that it has always been like this. Look at the way US agribusinesses manage to capture the bulk of subsidies intended for small farmers. Or the ability of large oil companies to write off their investment costs. Likewise, private equity funds have for years staved off efforts to treat their “carried interest” profits as normal income. As Warren Buffett likes to point out, he is still taxed at a lower rate than his secretary. But the Fannie and Freddie dispute offers the spectre of a dangerous tightening in the oligarchic grip on US democracy. In the past few years, the share of US income going to the wealthiest 0.1 per cent has skyrocketed. At the same time, the US Supreme Court has scrapped most remaining limits on political spending by companies and wealthy individuals. Billionaires come in all shades. Democrats like to target the Koch brothers, who bankroll much of the Tea Party movement. But liberals happily take private equity money to block reform of carried interest tax treatment. As in life, so in politics – watch what lawmakers do, not what they say. Fannie and Freddie must be reformed, says the bipartisan refrain. Let us see in practice if that is what they really mean. MARK CARNEY, governor of the Bank of England and head of the Financial Stability Board (FSB), an international watchdog set up to guard against future financial crises, was recently asked to identify the greatest danger to the world economy. He chose shadow banking in the emerging markets. Shadow banking certainly has the credentials to be a global bogeyman. It is huge, fast-growing in certain forms and little understood—a powerful tool for good but, if carelessly managed, potentially explosive. The FSB, which defines shadow banking as lending by institutions other than banks, reckons it accounts for a quarter of the global financial system, with assets of $71 trillion at the beginning of last year, up from $26 trillion a decade earlier. In some countries, shadow banks are expanding even faster: in China, for instance, they grew by 42% in 2012 alone. But there is disagreement about what counts as shadow banking. The core is credit (everything from China’s loan-making trust companies to Western peer-to-peer lending schemes and money-market funds). A broader definition, however, would include any bank-like activity undertaken by a firm not regulated as a bank: think of the mobile-payment systems offered by Vodafone, the bond-trading platforms set up by technology firms or the investment products sold by BlackRock. As our special reportexplains, services like these are proliferating because orthodox banks are on the back foot, battered by losses incurred during the financial crisis and beset by heavier regulation, higher capital requirements, endless legal troubles and swingeing fines. The banks are retrenching, cutting lending and shutting whole divisions. In America, for instance, investment banks are no longer allowed to trade on their own account, only on behalf of clients. British banks, meanwhile, have slashed their loans to businesses by almost 30% since 2007, with Barclays this week confirming plans to shed up to 14,000 staff. Shadow banks are filling these gaps. Nobody is too worried by competition to banks in their ancillary businesses: if, say, Google can help people manage their money more efficiently, that is to be welcomed. The argument is about credit. In some ways, it is a good thing that lending outside the banking system is expanding. Banks are regulated for a reason: they have big “maturity mismatches” (borrowing money largely for short periods while lending it out for the longer term), enormous leverage and are tangled up in complicated ways with other financial institutions, so they are especially fragile. And when they get into trouble, taxpayers tend to end up on the hook, because governments both guarantee deposits and are frightened to let such big and complicated institutions fail. So if some lending is moving from banks to less dangerous entities, the financial system should be safer. For these reasons, Mr Carney should be happier if, say, a British brewer takes a long-term loan from a pension fund or a life insurer with long-term liabilities instead of from a bank. If the loan goes wrong, the creditor will lose money, but without the gelignite of leverage, the elaborate web of counterparties and the depositors demanding their money now, losses in one institution are less likely to damage others. Yet shadow banks, if poorly regulated, can be just as dangerous as the better-lit sort. One of the principal culprits in the financial crisis was the “structured investment vehicle”, a legal entity created by banks to sell loans repackaged as bonds. These were notionally independent, but when they got into trouble they pulled in the banks that had set them up. Another source of instability were money-market funds, through which firms and individuals invested spare cash for short spells. These had been thought of as risk-free. When it became apparent that they were not, they suffered a run. The disaster taught regulators useful lessons. The shadow banks that caused the biggest problems had either big maturity mismatches or not enough capital to absorb losses. Most troublesome of all were those whose difficulties infected the banks, because the banks had either lent them money or had provided them with a backstop of some kind. Not surprisingly, the shadow banks that were created solely to take advantage of a less exacting regulatory regime turned out to be just as fragile and dangerous as banks. New regulations in many countries aim to make such shams impossible. Banks must now incorporate structured investment vehicles on their balance-sheets, for instance. Money-market funds must hold more liquid assets, to guard against runs. Limits on leverage have been imposed or are being considered for many forms of shadow bank. Yet as Mr Carney’s anxieties suggest, the job of making shadow banks safe is far from complete. For instance, American regulators are still allowing some money-market funds to create the impression that an investor can never lose money in them. They should be forced to be more honest. But the bigger danger lies in China, where regulatory arbitrage is happening on an alarming scale. Banks there are banned from expanding lending to certain industries, and from luring deposits by offering high returns. So they do both of these things indirectly, through shadow banks of various sorts. Meanwhile, some firms are setting themselves up as pseudo-banks: one shipyard makes a third of its money from finance (see article). It is hard to imagine that all the shadowy loans to unprofitable steel mills and overextended property developers will pay off. Yet investors are being encouraged to pile in by a series of bail-outs that have so far shielded them from most of the harm when such loans have soured. This is a crisis in the making. It will not bring China down—the government can use state-owned banks to temper its effects, and it has enough cash to spend lavishly to set things right. But it could still cost a lot. The sooner the regime spells out which assets are protected, the sooner investors will take more care about risk. Shadow banking can make finance safer, but only if it is clear whose money is on the line. Bruce Jones is Senior Fellow and Director of the project on international order and strategy at the Brookings Institution and a consulting professor at Stanford University. He is the author of Still Ours to Lead: America, Rising Powers, and the Tension between Rivalry and Restraint. WASHINGTON, DC – Many observers have cited the crisis in Ukraine as yet another example of American retrenchment and declining global influence. Some have also interpreted it as evidence of a Russian-led effort to mobilize the major emerging economies – Brazil, India, and China – against the West. While there is a kernel of truth in both narratives, each is a gross exaggeration, as is the notion that America’s capacity to shape a secure and prosperous international system is in decline. The US has had a rough few years. After two long, draining wars, its withdrawal from Afghanistan is inching along slowly. In Syria, Russian and Chinese intransigence have frustrated its efforts to find a diplomatic solution. And China’s growing assertiveness in the South and East China Seas is threatening US regional dominance, while raising the risk of a crisis with America’s close ally Japan. Meanwhile, many of America’s European allies are mired in economic malaise. And, though the US economy is recovering from the global financial crisis, America’s treasury and reputation has been dealt a severe blow. Nonetheless, the US remains the most influential global actor – not least because of the strong alliances that it maintains. All of the attention given to China’s economic rise – and, to a lesser extent, that of India and Brazil – has overshadowed the success of US allies like South Korea, Turkey, Indonesia, and Germany. In fact, the vast majority of the world’s strongest economies are allied with the US. Moreover, far from coalescing into a united anti-Western bloc, the emerging powers remain sharply divided. There are far more overlapping interests between the established and the emerging powers than the “West versus the rest” narrative suggests; indeed, the rising powers often share as many interests with their Western counterparts as they do with each other. Given this, even the economic powerhouses that are not US allies do not want to upend the existing world order, but rather to gain more space within it, such as through increased authority in international institutions. After all, they rose precisely by integrating themselves into the global economic system. Even China, which arguably seeks to curtail US leadership in some domains, has no choice but to cooperate with the US and its allies on many foreign-policy issues. China can challenge American leadership only if others follow it, and so far it has found few takers. Only Russia has sought to play a more destabilizing role – during the global financial crisis, in Syria, and now in Ukraine. To be sure, the emerging powers do share a strong inclination toward rivalry – or at least toward autonomy – which is rooted in what might be called the “psychology of rise.” But they know that an excessively aggressive stance toward the US would undermine their interest in a stable global economy and the safe passage of their goods and energy through international sea and air routes. This is particularly true for China, because its domestic stability and international influence depend largely on its ability to maintain rapid economic growth, which demands ever-larger quantities of imported energy and other natural resources. To ensure unimpeded access to these critical resources, China needs stability in the countries from which it can extract them, in the markets in which it can invest, and in the routes linking China to its suppliers. But China’s capacity to maintain these conditions is extremely limited – and in some cases (as in the Persian Gulf), it is heavily dependent on US military power. In short, striking a balance between the impulse toward rivalry and incentives encouraging restraint is the most important dynamic in contemporary international affairs. And, for now, the global balance is tipping toward restraint. Of course, the US will invariably face new challenges, all of which are on vivid display in Ukraine. Countries will be torn between retaining their security ties to the US and building new economic linkages with China. The complex global systems in which America’s interests are enmeshed will test US diplomacy. Perhaps the most dangerous challenge is the prospect of emerging powers leaning increasingly toward autonomy, instead of alliance. China and India may not have been happy about Russia’s actions in Ukraine, but none of the emerging economies could bring itself to vote against Russia in the United Nations General Assembly, even though the vote was ultimately meaningless. (China took the strongest position in the Security Council by abstaining.) They are not sticking with Russia; but they are not joining a Western effort to isolate Russia, either. Ultimately, however, the world’s relentless evolution plays to America’s most important strength: its unique ability to build broad and disparate coalitions. The range of alliances and relationships that the US has created, including with several of the rising powers, far surpasses that of any other global actor – and will continue to do so for the foreseeable future. This is perhaps the most enduring feature of American power. There is no denying that the US no longer enjoys the unrivaled hyperpower status that it did at the end of the Cold War. But, for the time being, the international system remains America’s to lead. As banks retreat in the wake of the financial crisis, “shadow banks” are taking on a growing share of their business, says Edward McBride. Will that make finance safer? IT WOULD BE hard to find a company with a greater sense of tradition than Hall & Woodhouse brewery. Founded in 1777 in the English county of Dorset, it is still based just a few sheep-speckled hilltops from the village where it began. It is also still owned and run by descendants of its founder, Charles Hall (the Woodhouses married into the family in 1847). It has been brewing on the same site, using water from the same wells, since 1900. 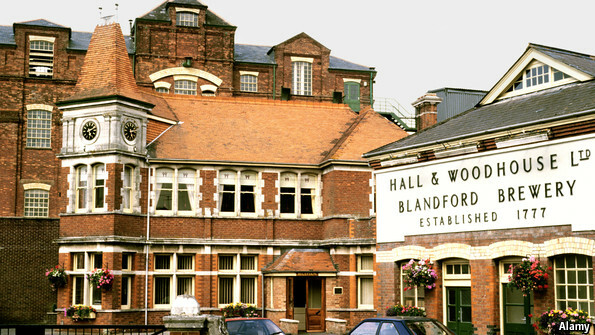 The firm’s grand Victorian brewery complex (pictured above), with its clock tower, turrets and red-brick smokestack, has been preserved with pride. A museum inside displays ancient brewing equipment, a stuffed badger and sepia-toned pictures of the Halls and Woodhouses of yore, alongside records from Hall & Woodhouse’s earliest days. They show, for example, that on October 22nd 1779 the firm paid a Mr Snook 18 shillings for seven quarters (roughly 90kg) of barley. Even the names of the beers, such as “Fursty Ferret” and “Blandford Flyer” (said to help ward off the insects that plague local fly-fishermen) are steeped in rural nostalgia. Until this year the firm’s financial arrangements were equally traditional. It never listed its shares or issued a bond. Instead, whenever it needed to finance a big new project, such as the gleaming new brewing facilities that abut the Victorian ones (now converted to offices), it borrowed money from a bank. Given its steady income, its low level of debt and its pristine credit record, it never had any trouble getting a loan, says Martin Scott, the firm’s finance director. The financial crisis changed all that. When in 2010 Hall & Woodhouse asked its main bank, the Royal Bank of Scotland (RBS), to renew its regular £50m ($84m) line of credit, it got a nasty surprise. The management of RBS had been far less prudent than that of Hall & Woodhouse, borrowing heavily over the preceding years to expand its business at breakneck speed. When its own credit dried up, it was forced to turn to British taxpayers for a £45 billion bail-out and began a frantic retrenchment, shedding £1 trillion in assets and cutting its staff by 40,000. The bank told Hall & Woodhouse that it would renew its line of credit for only three years instead of five, and at a sharply higher rate of interest. Mr Scott balked at this and arranged a similar loan facility at another, less troubled bank, but the incident unsettled him and the owners. They decided they needed more reliable long-term creditors, so they reduced their bank borrowing and turned instead to a shadow bank—a financial firm that is not regulated as a bank but performs many of the same functions (seearticle). The one they picked was M&G (the asset-management arm of Prudential, a big insurance firm), which offered them £20m over ten years. Shadow banking got itself a bad name during the financial crisis, chiefly in the form of off-balance-sheet vehicles that were notionally separate from banks but in practice dependent on them. Their assets were often securitised loans that turned out to be much riskier and less valuable than expected. These vehicles were meant to expand credit, and thus bolster the economy, while spreading the risks involved; at least that was the justification for excluding them from the banks’ liabilities and allowing them to hold relatively little capital to protect against potential losses. Yet when they got into trouble, the banks had to bail them out on such a scale that many of the banks themselves then needed bailing out. The vehicles turned out to be an accounting gimmick dressed up as a service to society. Worse, they generally relied on short-term funding from money markets, another form of shadow banking. Money-market funds, in which businesses, institutions and individuals invest spare cash for short periods, involved a different sort of subterfuge. Although all lending is inherently risky, they presented themselves as risk-free. Their shares were supposed to retain a steady value of $1, so when one of the biggest funds announced at the peak of the crisis that it would have to “break the buck”, panic ensued. The flight from the money markets added to the troubles of banks and other financial institutions that relied on them for short-term borrowing. They had made big losses, were struggling to borrow and so found themselves unable to repay depositors, bondholders and other creditors. That left taxpayers on the hook, both because governments in most rich countries guarantee small bank deposits and because they were reluctant to let big banks fail, for fear that the financial system might fall apart altogether. Banks have since had their room for manoeuvre severely restricted to make them safer. New accounting rules have made it much harder for them to park suspect assets in off-balance-sheet vehicles. In effect, lending by banks must be labelled as such. And they are now obliged to hold much more capital to help absorb losses in case another crisis strikes. There are only three ways for them to increase capital relative to their loans and other assets: by raising more of it, by cutting costs or by trimming lending and investment. Banks around the world have been doing all three for several years, to the dismay of firms such as Hall & Woodhouse. They have an especially strong incentive to curb long-term loans to business, since regulators not only require them to hold more capital against them but also to fund long-term loans in part with long-term borrowing, which is more expensive than the fly-by-night sort. As a result, bank lending to businesses in America is still 6% below its 2008 high. In the euro zone, where it peaked in 2009, it has declined by 11%. In Britain it has plummeted by almost 30%. Bank lending to consumers has shrunk by less, in part because most of it consists of mortgages, which take some time to unwind (see chart 1). But all in all, big Western banks have shrunk their balance-sheets by trillions of dollars. This retreat of the banks has allowed the shadow banking system to fill the ensuing void. Mr Scott of Hall & Woodhouse, for one, is happy to be able to borrow from somewhere other than a bank. Although his arrangement with M&G is slightly more expensive and less flexible than the shorter-term credit he is still getting from the banks, he says it costs far less in terms of managers’ time and allows the firm to plan for the longer term. British banks, he says, simply do not offer ten-year loans to firms like his any more because they cannot make a profit on them. M&G has no such concerns because it is not considered a bank, nor regulated as such. The money it has doled out to Hall & Woodhouse comes directly from institutional investors, including Prudential and various pension funds, which have given M&G £500m to lend to mid-sized British businesses. All the proceeds from the loans go to the investors, who must also bear any losses; M&G simply administers the portfolio of loans on their behalf and charges them a fee. Whereas a bank intermediates between savers and borrowers by entering into separate transactions with each, with all the risk that entails, M&G is merely a matchmaker, with no “skin in the game”. For all their residual worries about shadow banking, regulators like this arrangement, because in some ways it makes the financial system safer. If the economy stumbles, causing corporate earnings to slide and thus increasing the number of defaults on loans such as Hall & Woodhouse’s, any losses will fall squarely on the institutional investors who put up the money. It is not just M&G that has benefited from the banks’ retrenchment. The business of “direct lending” or “private debt” (by analogy with private equity) is booming. Investment funds that make loans of this sort raised $97 billion last year worldwide and hope to raise a further $105 billion this year, according to Private Debt Investor, a magazine. Another similar but exclusively American category, business development companies, grew tenfold between 2003 and 2013, according to the Securities and Exchange Commission. At the end of last year they held assets—mainly loans to businesses—of roughly $63 billion. And private debt is only one form of lending that takes place outside banks. 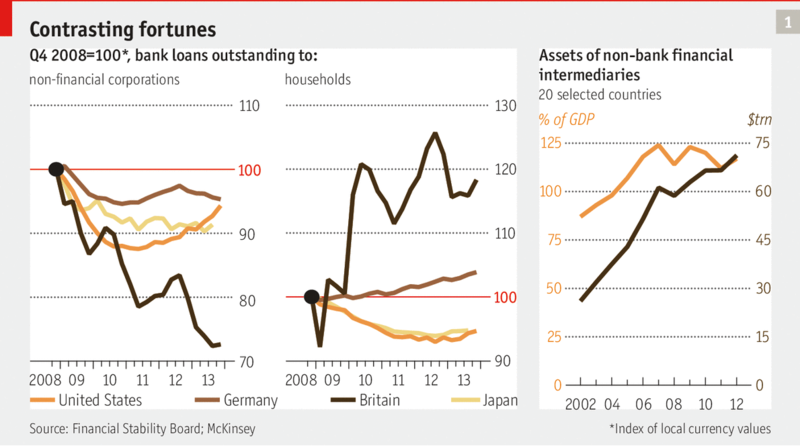 Bond markets—by far the biggest source of non-bank financing—continue to grow even as bank lending shrinks. In 2007 the value of all outstanding corporate bonds issued by American firms was just under 29% of GDP; by last year it had risen to over 42%, according to McKinsey. In South Korea the figure rose even more dramatically, from 23% of GDP to 48%. Globally, corporate bond-issuance doubled between 2007 and 2012, to $1.7 trillion, as firms everywhere took advantage of extraordinarily low interest rates. Money markets in the rich world seized up during the crisis and have not yet fully recovered, but in China and other emerging markets they are growing rapidly. A money-market fund launched last June by Alibaba, a Chinese e-commerce giant, attracted 500 billion yuan ($81 billion) in its first nine months. Peer-to-peer (P2P) lenders—websites that match savers with borrowers—are also growing like topsy, albeit from a tiny base. The value of loans chaperoned by Lending Club, the biggest such website, has doubled every year since its launch in 2007 and now totals over $4 billion. New firms are springing up the world over to cater to all manner of niches, from short-term loans for property developers to advances against unpaid corporate invoices. The Financial Stability Board (FSB), a global financial watchdog, reckons that shadow lending in all its forms accounts for roughly a quarter of all financial assets, compared with about half in the banking system. But it excludes insurance and pension funds from its calculations; add those in, and shadow banking is almost on a par with the better-lit sort. According to the FSB, shadow lending has grown by leaps and bounds in recent years. The watchdog estimates that such loans in the 20 big economies that it tracks rose from $26 trillion in 2002 to $71 trillion in 2012 (see chart 1 above). The FSB’s data show bank lending growing at much the same pace, but that is partly because, in the teeth of the crisis, regulators forced financiers trying to game the system to reclassify much shadow lending as bank lending. The FSB’s data confirm that the sorts of shadow lending that worry regulators, particularly off-balance-sheet vehicles, have atrophied, whereas the sorts that please them, including direct lending, have rocketed. The process of shifting lending out of the banks and into other financial institutions has long been underway in America, where bond and money markets are well-developed; banks there now account for only a quarter of loans. But it is also gathering pace in Europe, where banks have been especially hard hit by the crisis, and in other parts of the world. And lending is just one area in which banks find themselves on the back foot. The same combination of stricter regulation and increased competition is hurting banks in other areas that used to be seen as an integral part of their business, such as payments, the mundane but important business of transferring money from one account to another. The most common and lucrative way for payments to be made in the rich world is through credit or debit cards. Regulators in America and the European Union have been putting limits on the fees banks can charge for such transactions. At the same time all sorts of new payment technologies are springing up, from “virtual wallets” that claim to make the physical sort redundant to Bitcoin, a scandal-prone electronic currency that nonetheless has the potential to turn the business of sending money upside down, cutting banks out of the process altogether. The trading of bonds and other financial instruments—the mainstay of investment banking—is another area where banks are pulling back in the face of new technology, new rivals and new regulatory constraints. Rules that bar or deter banks from trading on their own account, and make it more costly to do it for others by increasing capital requirements, have already resulted in a big drop in the volume of bonds held by investment banks. Other regulations now being introduced are pushing the trading of derivatives onto public exchanges, greatly reducing banks’ influence over the business and the profits they can make from it. Regulators are also discouraging banks from dealing in physical commodities in any form. Other financial institutions are cheerfully abetting the regulators’ drive to wrest a lot trading from banks. The banks’ big customers—chiefly asset managers of various kinds—are trying to create systems to trade more among themselves, cutting out the middlemen. The shift away from fast-talking salesmen towards electronic trading is also bolstering exchanges, technology firms and data providers at the banks’ expense. Similarly, asset management (which this report will not cover in detail) has been growing much faster outside the banking system than within it in recent decades. The crisis accelerated the trend, as some banks sold their asset-management arms to raise money. Regulation designed to protect investors from conflicts of interest makes it hard for a big bank to do business with an in-house asset-manager, reducing the opportunities for savings or cross-selling. And new technology is making it easier for firms and individuals to find and invest in a range of financial instruments without the help of a bank. The world’s biggest asset manager, BlackRock, with about $4 trillion under management, is now considerably larger than the biggest bank, the Industrial and Commercial Bank of China, with assets of roughly $3 trillion. Before the crisis the reverse was true. This does not mean that banks are about to fade away; only that their relative weight in the financial system is diminishing as other financial institutions proliferate and grow. Indeed, that is largely what regulators intend. They want to see banks shrink and welcome the transfer of risky assets to other parts of the financial system. This special report will chart some of that transition and consider the potential pitfalls.